Posted on January 21, 2019 by Greg Kaz. Leaks could be a huge problem for anyone whether it happens at their home or their business. Leaking roofs could damage to property and stock in a store, and it could cause damage to the insulation and the walls. It could even cause hazards on the floor as water drips and pools. This could be costly to take care of, and it is not something that you would want to have to deal with if you didn’t have to. The good news about EPDM Liquid Rubber is that right after the installation, the waterproofing protection will start – even before it is fully cured. While it goes on like liquid, when it dries and cures, this product will provide you with a strong and durable barrier that protects your roof from all of the outside elements. This protection will ensure that you no longer have to worry about leaks, which will let you rest a little easier when you see dark clouds gathering overhead. When you have this coating on the roof, it can last for up to 20 years. That’s a lot of protection for what amounts to very little work and cost. Another benefit of this roofing option is the weight. When you compare it to other types of materials, such as tar, the weight is very minimal. After all, you will only need to have one or two thin coats, so it will not add a lot of weight to the roof. Even though there is the initial cost of the product, you will find that the cost of Liquid Rubber tends to be quite low compared with other options. Additionally, when you think about the protection that it offers, you will quickly see that it is far cheaper to spend on this type of roofing material than it is to pay for expensive repairs to the roof or building later. Another of the Liquid Rubber benefits that many people never consider is that it has the potential to be energy efficient. You will notice that the product comes in both black and white. When you have white material on your roof, it will help to reflect the sun’s rays, and that can help to keep the building cooler. This could lower energy costs because you will not have to run the AC as much. If you are in an area where it gets colder, you could choose the black coating, which can absorb the sun’s rays and help to keep it warmer inside. Therefore, a business in Maine might want to have black waterproof sealant, whereas a company in Arizona might want to have white. Is there anything that the EPDM Liquid Rubber can’t do? While it offers many nice benefits, there are some instances where you will not want to use it. If you have a property that has a steeply sloped roof, it will not be a good idea. This is because it will not dry fast enough, and it will run and pool toward the lower portion of the roof. It could even drip off the roof. Therefore, it tends to be a better solution for low-sloped and flat roof. Other than that, there is no reason that you wouldn’t want to use Liquid Rubber. Just think about all of the benefits listed above. Why You Should Opt for Liquid Rubber? Posted on March 18, 2014 by Greg Kaz. You should opt for liquid rubber as it is a very useful, efficient and unique matter which has been used as a roofing solution with tremendous success. It was originally created by Kuraray Co. Ltd. in 1972 as a thick, viscous liquid which is derived from butadiene, isoprene and/or styrene. It is transparent and odorless. One of the primary uses is that it is used at a “Reactive Plasticizer”. It comes in liquid form and when used, it cures to form a hard and sturdy surface holding almost any required shape. It is successfully used for a variety of purposes, ranging from toys which are molded to useful roofing solutions. Liquid rubber has been specially used all over the North America for over 20 years, in places and areas where extreme temperature spikes and fluctuations is a norm. It is very easy to use and an extremely productive seamless waterproof membrane. Due to its special characteristics, it can easily meet most of the health, safety and environmental requirements, and therefore provides great industrial and commercial benefits. Applying liquid rubber is a simple, hassle-free and safe process. You can apply it on the required surface area using a brush and roller which is more appropriate for small scale residential projects. The large scale projects, for which you can use it, include factory or warehouse roofing which uses a spray system. It can be sprayed on the required surface area and this method can be used to cover up to a thousand square meters in a single day. This method is generally referred to as “Instant Set”, and it does exactly what the name suggests – the liquid rubber takes the required shape naturally and instantly, giving you instant waterproofing. Since the rubber that is sprayed is cold, it also eliminates any potential fire hazards, and it forms itself quickly as singular and seamless membrane. Since this method does not require the usage of any fleeces or primers, this method of roofing has proved to be up to five times faster than many other comparable roofing solutions. Its unique composition gives its users an astonishing elasticity of up to 1100% along with a startling memory of 95%. It is almost unparalleled when used as a roofing solution on roofs which are expected to face excessive movements. This roofing solution provides similar advantages to that of EPDM roofing solution – it offers protection against ozone and heat, as well as provides good resistance against polar substances and steam. Additionally, liquid rubber roof is also resistant to water, salt and alkalis. It also gives a smooth, crease-free surface, and is easy to apply. The only issue with this type of roofing is that you cannot directly apply it to asphalt roofs or asphalt shingles. You need to first apply a coat of acrylic solution on which the liquid rubber can then set itself. Posted on January 25, 2013 by Greg Kaz. There are three basic types of flat roofing materials, although there are variations within the three categories that allow building owners to have more choices. Whether your building is new and this will be its first roof or you are replacing older roofing material, here are the three main categories you will be able to consider. There are inherent advantages and disadvantages of each type. Built-up bituminous roofs have been the standard for many years. They are still relatively popular primarily because they are inexpensive. Built-up bituminous roofing is created using layers of hot tar, gravel, a smooth river stone ballast and tar paper or fiberglass membranes. Other than the lower cost, the advantages include fire resistance and some people think the appearance is more attractive. There are several disadvantages. The material is very heavy. The underlying joints of the roof may need to be strengthened in order to install this type. The installation itself is messy and smelly. It is not a do-it-yourself job for the building owner. Once installed, it is hard to find leaks in the material and repairing leaks can be difficult. As time goes by, the gravel can break loose and clog the gutters. This choice is not recommended for buildings that are currently occupied. Modified bitumen sheeting has a mineral-based surface to convey the fire resistant benefits of built-up bituminous with less weight. The sheeting consists of a single layer that is rolled onto the roof. The sheeting may be attached using a “torch-down” system, although newer modified bitumen rolls have a peel-off backing that sticks to the existing surface. The peel-and-stick installation can be a DIY project for the building owner. One advantage of modified bitumen has to do with the light colored minerals that are embedded in the sheets. The minerals reflect heat, which can convey energy savings in areas where summer air conditioning costs are high. This is also an affordable alternative. The main disadvantage of the torch-down system is the risk of fire. The process is not recommended for buildings that are currently occupied. The sheets are not the most resistant to scuffs and tears. Modified bitumen is considered less durable than the next type. EPDM is a type of synthetic rubber. It resembles an inner tube but has been engineered to resist damage from sunlight. EPDM sheets are available and can be anchored with fasteners, glued on or ballasted with stones. Liquid Roof is another form of EPDM rubber is also available for waterproofing or coating existing roofs to extend the lifespan of the roof. The advantages include easy installation and high durability. Rubber is inherently accompanied by a reduced risk of leaking. If leaks do occur, they are easy to locate and repair. There may also be a sound-reduction advantage. The only disadvantage may be heat absorption depending on the color selected. Lighter colors are recommended for warm climates but may cost more. Some building owners feel that the cost is a disadvantage. EPDM does cost more than other roofing materials. But because it is more durable and typically lasts longer, EPDM may cost less in the long run. For product information or ordering visit EPDM Coatings or call them at 855-281-0940. Ice dams occur due to uneven temperatures on a sloped roof. The greater the slope of the roof, the more damage an ice dam can do. The process is usually set into action by snow, although an ice storm could also be the trigger. What happens is that snow or ice on the higher portions of the roof melts. The melt or water flows down the slope until it reaches a point on the roof where the temperature is below freezing. Often, the point that is below freezing is an overhang where there is little or no warming from radiation, convection or conduction of heat. When the water reaches the lower temperature, it freezes. Water from above continues to flow down the slope and remains liquid until it reaches the ice. Over time, the result is an ice dam. It is a dam in that it traps water behind it. The water can only freeze if it reaches the colder portion of the roof. Icicles typically form below the dam as some melting occurs during the day. Seeing icicles along the edge of a roof can be a sign that an ice dam has formed. The damage that occurs to the building is mainly from the water, although the weight of the ice can also cause damage if the overhang on which it rests is not strong enough to support the weight. The water behind the dam searches for an outlet. It starts to work its way through the roofing material and into the insulation. Once inside the building, the water spreads through the insulation and down the interior walls. It can also spread across the ceiling causing stains and damage to dry wall or other materials. Ice dams can be prevented in the planning stages of a newly constructed roof. Additional insulation can be used to make sure that the ceiling is airtight. Warm air travels through the ceiling and into the attic space. The warm air rises, causing the higher portions of the roof to be warmer than the lower portions. Reducing heat loss prevents snow melt. The roof must be strong enough to support the extra weight of the snow. In areas where a large amount of snow falls on a regular basis, there are usually requirements concerning the load that a roof can bear. Snow rakes can also be used to remove snow and prevent ice dams. Caution is required when using the snow rakes to avoid personal injury and prevent damage to the roofing materials. 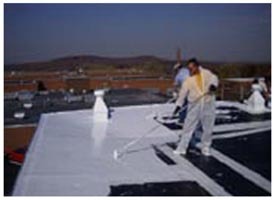 There are products like elastomeric roof coatings, liquid rubber and liquid roof that are one the best products in the market to save your roof from damage. 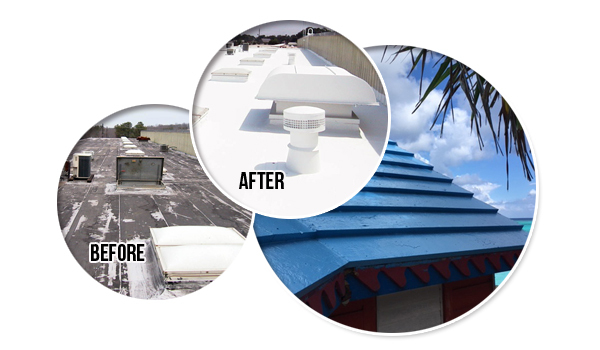 The effects of environment on your roof are responsible for how it changes in appearance as the years go by. Just as your skin ages, so does your roof. One thing that ages both your skin and your roof is the sun. The sun can cause the temperature on the roof to be 50-75 degrees higher than the temperature of the surrounding air. The heat alone can cause some roofing materials to blister and crack. It’s the main source of roof leaks. In addition to the heat, the sun is a source of UV radiation. UV radiation has been shown to degrade the asphalt layers that make up your shingles. A protective layer of colored granules is used to reduce this effect. Liquid EPDM Rubber coatings are the best option to coat your roof shingles. Without that kind of roof coating the shingles would degrade very quickly. The use of the granules has added years to the lifespan of modern roofs. Sudden changes in the roof temperature also speed the shingle aging process and roof starts leaking. Thunderstorms are common occurrences on hot days in many parts of the world. The temperature on the roof rises gradually as it is heated by the sun. When the rain starts to fall on the roof, the temperature can drop as much as 60 degrees almost instantly. The wooden decking beneath the shingles expands with the heat and then contracts suddenly with the quick cooling. This places a strain on the shingles. As with other effects of environment on your roof, the aging process is relatively slow. But you have these sudden changes in temperature many times during a year. This is one of the reasons that shingles have a limited lifespan. Moisture from rain and snow also has a negative effect on your shingles unrelated to the temperature change. Moisture causes wooden roof decking to expand. From the perspective of the shingles, the deck is moving. The movement loosens the shingles. The effects of environment are worsened because of pollution and acid rain. Pollution hits the roof along with raindrops. Smoke from car exhausts, factories and other sources lands on the roof. The pollution causes the color of the shingles to darken, sometimes only in spots that are noticeable from the driveway. Acid rain degrades the asphalt in shingles. The acid eats away at all parts of your roof gradually. None of these changes occur suddenly. It may seem sudden if you get up on a ladder to clean the gutters and suddenly notice curling, blisters, cracks or stains. There is only so much you can do to minimize the effects of environment on your roof. Some aging is inevitable. Summer is the best time to fix your roof leaks problems. 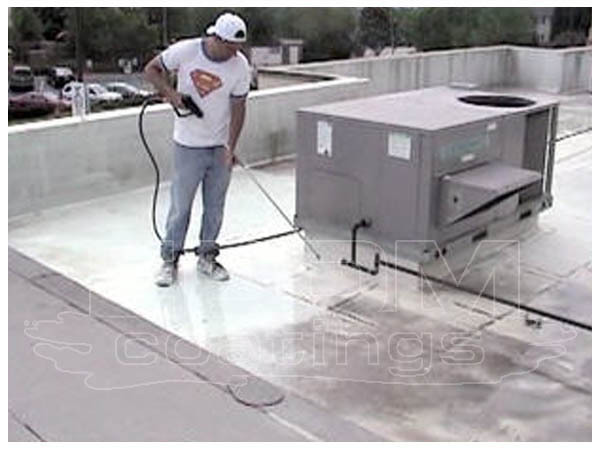 You can get rid from such roofing problems by selecting the best roofing products like liquid epdm, liquid rubber and liquid roof coatings for your roof. Liquid Rubber is the only Liquid EPDM product in the world. Liquid roof coatings are also the best option for your RV Roof Repair problems. Are You Considering Doing an RV Roof Coating Repair?